My Simplified Day || 2015 at a Glance || 2016 at a Glance – Visit the Free Printable Library to find and download these. Print at home and enjoy! Monthly Calendar || Daily Devotional || Sunday Prep Checklist – Visit the Free Printable Library to find and download these. Print at home and enjoy! Blog Planner || Gratitude Journal || My Go-To Meals – Visit the Free Printable Library to find and download these. Print at home and enjoy! 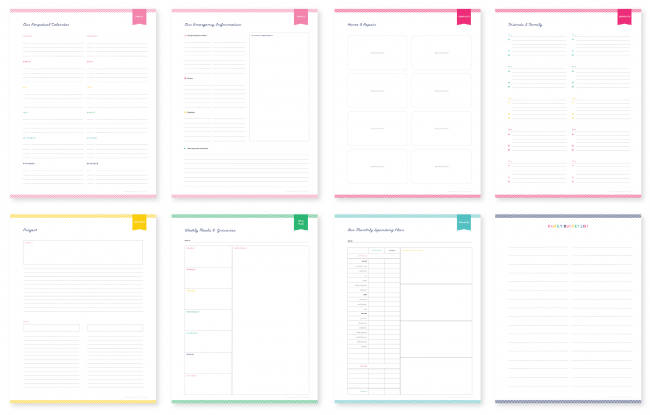 Health & Fitness Tracker || Meeting Details || Kitchen Measurements – Visit the Free Printable Library to find and download these. Print at home and enjoy! More Meeting Details || Packing Checklist || Family New Years Meeting – Visit the Free Printable Library to find and download these. Print at home and enjoy! Another Packing Checklist || Passwords & Logins || Party Planning Checklist – Visit the Free Printable Library to find and download these. Print at home and enjoy! Prayer List || Recipe || Kids: Bedtime Routine – Visit the Free Printable Library to find and download these. Print at home and enjoy! Valentine: Crayons || Valentine: S’mores || Kids: Chore Chart – Visit the Free Printable Library to find and download these. Print at home and enjoy! Love Coupons: Babysitting || Afternoon Off || Coffee or Ice Cream Date || Date Night Out || Date Night In || Full House Cleaning – Visit the Free Printable Library to find and download these. Print at home and enjoy! The Home Base Binder can be purchased two different ways: as a KIT (with our beautiful binder!) or just the pages and dividers (called a Refill Pack) for use with your own binder. Each includes: Perpetual Calendar for remembering birthdays / anniversaries / etc every year, Emergency Info, Home & Repair page for business cards, Friends & Family page for contacts, Monthly Projects pages (12 – one for each month), Grocery Shopping / Meal Planning pages (52 – one for each week of the year), Monthly Budget / Spending pages (12 – one for each month) and a Family Bucket List. (Save 10% with code YAY2015! 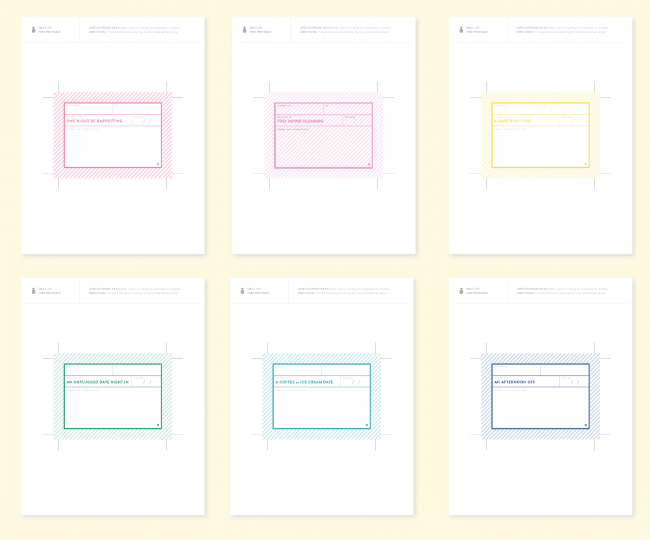 Our Simplified Notepads have bright colors and gold foil (who could ask for more) and come in eight formats: To Do, Groceries, Thank You’s to Send, Weekly Meal Calendar, Info for Babysitter, A Note from Mom, My Little Ones Day, Have a Great Day (a general notepad for leaving love notes). Instagram got a little overwhelming with suggestions, so I thought we’d collect them here. Leave a comment with your ideas for free printables NOT mentioned above and I’ll choose a few to work on! Also, save 10% on our Home Base Binder, Refill Kit and Simplified Notepads through the end of this week with code YAY2015! PS: Some of you mentioned wallpapers and iPhone lock screens (works for Android too) – those are all found here. PPS: If you have questions about our Simplified Planners, you can find all the details on those here.